Will A Garbage Disposal Be A Benefit To Me? First used only in commercial applications, garbage disposals are now common in most modern homes. One of the few places you cannot use one is where you have a septic system, as the system cannot break down the material fast enough and it will soon stop working. 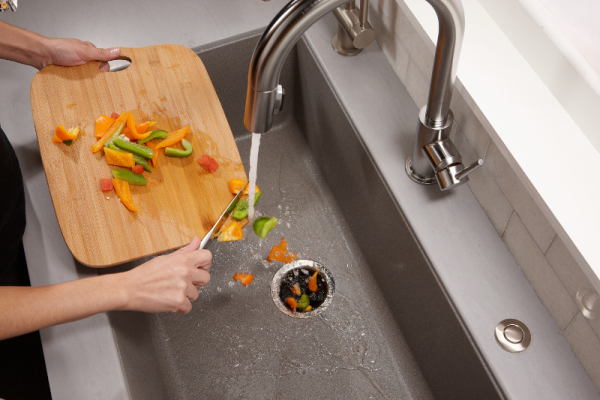 A garbage disposal can take almost all food waste, except bones and stringy fibers like cornhusks and silk. Installing a garbage disposal – Most modern sinks have a drain opening large enough to fit a disposal, as they are of a universal size and shape. While installing a garbage disposal can be a do-it-yourself job, many prefer to have a plumber do the installation, as the unit is heavy, and the space below the kitchen sink is cramped and dark. The drainpipe and “P” trap have to be removed before the disposal is installed, and then reinstalled after, and an electrical connection has to be either provided, with a power cord or hard wired in an electrical box. Types of garbage disposals – Garbage disposals are one of two types, batch feed, or continuous feed. A batch feed has a cap, or plug, that you place in the opening after you have filled the disposal with a “batch” of garbage. This is considered a safety feature, as foreign object like silverware, and human hands, cannot accidently fall into the whirling blades while in operation. A continuous feed is just that. The opening is always open so you can continuously feed garbage into the disposal while it is operational. Sometimes the unit may vibrate a lot and giggle items into the sink and then the disposal. DANGER: Never put your hands into the disposal to clear a clog. Some units will reverse direction each time they start, which helps clear clogs. CLEANING TIP: Use ice cubes to clear clogs. If they lock up the blades they will just melt and do no damage. http://knoxvilleplumbingllc.com/wp-content/uploads/2014/06/Disposer_In_Use_CloseView_v48_12.03.12-resized-600.jpg.png 400 600 Robert Keith http://knoxvilleplumbingllc.com/wp-content/uploads/2016/09/Website-Logo-KNoxville-Plumbing-2.png Robert Keith2014-07-12 15:55:592014-09-05 14:29:00Will A Garbage Disposal Be A Benefit To Me? How To Clean A Toilet Should My New Home Have a Plumbing Inspection?